Two weekends in a row?! We had a ridiculously long day of exploring the Library of Congress, the U.S. Capitol, and Arlington Cemetery - oh, and I need to mention scarfing down a burger and shake at Good Stuff Eatery. This burger joint was started by Top Chef contestant Spike Mendelsohn (who was there and happily handed me my water cup). It was also slightly reminiscent of Shake Shack (read: incredibly juicy and delicious) so I clearly was in heaven. After our marathon day, we went to relax at Jessica's apartment and but what, to my delight, was on Food Network but "Pizza Wars: NY vs. Chicago"! 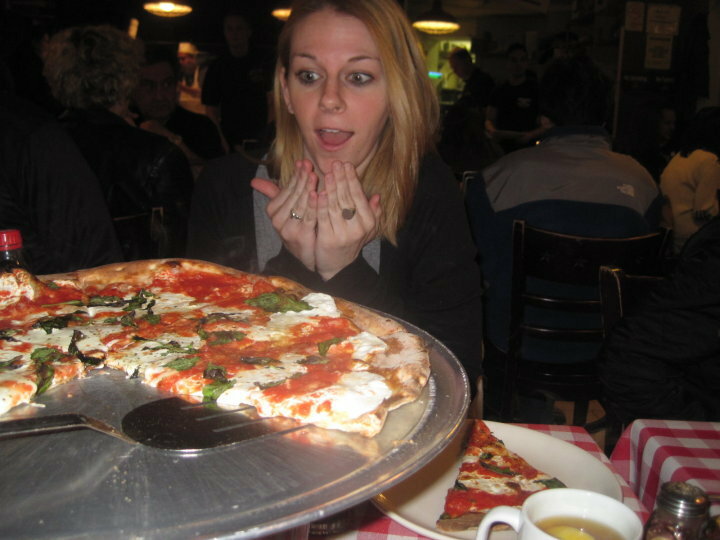 I admit that I have never been to Chicago and that I actually fell asleep during the Chicago portion of the show, but I obviously have a lot to say about NY Pizza. Lombardi's Pizza - Soho - 32 Spring Street - Lombardi's, founded in 1905, was the first pizzeria in the entire country. That is a pretty big deal. I discovered this establishment three autumns ago while on rotation here for work. Since I love it so much and since it is *so* New York, it was also the first place I shared with my parents and sister the first time they came to visit me last fall. What I really like about Lombardi's, aside from obviously the taste and the history, is its location on Spring Street, one of my favorite streets in one of my favorite areas of NY. More on Spring Street another time, but I should share now that there is a park right across the street where you can eat your take-out pizza if there is no room to eat in the restaurant (very likely on a weekend). Grimaldi's Pizzeria - Brooklyn - 19 Old Fulton Street - If you ever make the (really easy and beautiful) trek over the Brooklyn Bridge, you need to go get Grimaldi's Pizza on the Brooklyn side. There are also locations in Garden City, Queens, and two in Hoboken, but you've got to try the original. Yes, when Aubrey and I went on a Sunday in March we waited in line for almost two hours, but as I've explained before, long lines for food are totally worth it! This is my "surprised" look. Lil' Frankie's Pizza - East Village - 19 First Ave (and 1st St.) - I've been to this gem just twice and both times were well past two in the morning, but this isn't actually a drunk pizza place, it is a fabulous Italian restaurant that just so happens to be open late night. If you are lucky, you might get to sit next to a couple who has just met in person after meeting online in a Harry Potter chatroom and you can listen in on their conversation. If you are *really* lucky, they will be decked out in full wizard gear. Adrienne's Pizzabar (Financial District - 54 Stone Street) - rectangular pizza and lots of handsome investment bankers in suits. 'Nuff said. Artichoke Pizza (East Village - 14th St & 2nd Ave and Chelsea - 17th St & 10th Ave) which has pizza with Spinach Artichoke dip on it!! Zigolini's Pizza Bar (Hell's Kitchen - 9th Ave & 46th St) - I haven't tried this yet, but I'd like to plug my friend Amanda's family's newest restaurant. Based on eating at their other restaurant, Zigolini's in the Financial District (66 Pearl Street), the pizza has to be awesome. I'm not even going to mention the place near my work that has free pizza during happy hour. I can't name it because I'm pretty sure I'm no longer allowed there after accidentally stealing four slices of pizza from a party who actually *ordered and paid for* the pizza, while I thought it was the "free for happy hour" pizza. I haven't really lived that down at work yet. My friends and I have decided that the new Friday night is at Sweet Caroline's Dueling Piano Bar in Times Square (46th bt 6th & 7th Avenues). Two piano players and one drum player perform song requests from tourists (and the occasional New Yorker). The song slip tells them what you want to hear, the amount of money you give with the song slip tells them how badly you want to hear it...and if you don't like a song they are playing, you can request a new one with a higher bid. The first time Mendy and I went to Sweet Caroline's, we were apparently in the wrong crowd with the lowest payments for songs being $20. This time, people were requesting songs for $2, so we were actually able to participate (and, in some cases, dominate). In addition to the song costs, there is supposed to be a cover charge, but the people on the street and the website say it is $20, the people on the phone when you call say $10, and we didn't pay anything somehow. There is also a two-drink minimum but they don't seem to enforce it and the drinks are not badly priced and really strong. Like, really strong. Walking into the bathroom with Nicole before the show started and being confronted with four Russian women waiting and "being good friends" while their one friend was in one stall. Coming out of the stall to see three of the women pushing the other one OVER the door of the stall where their friend was so she could open the door. Seeing their friend (who they are *such* good friends to) asleep with her head (ick) on the toilet seat. Passing a request sheet to the piano players during someone's (stupid) request of "Wake Me Up When September Ends" with a note saying "Wake me up when *this song* ends..."
Interrupting a group from Boston's song request of "I'm Shipping Up to Boston" with a higher bid for "Empire State of Mind" just to show them which city was cooler. Mendy waiting about an hour to hear his request of "Crazy Beeyotch" (yes, I just censored my blog) and having them play the song ten seconds after he leaves to go to the bathroom and finishing before he comes back. Paying $4 to hear "Whip my Hair", the piano players not knowing it, acting like they didn't know how to play Justin Beiber, and eventually settling on Miley Cyrus's "Party in the USA". They begged the whole time for people to outbid Nicole and me to play a different song, but everyone loved it a little too much. Either that or they actually believed me when I was asked how much I paid for it and I yelled "$4...$17...$17,000!" which no one could outbid. Mendy inquiring about this "luxury"
One of the top things on my NYC To-Do list (not to be confused with my Holiday To-Do List in NYC for 2010, my 26 things to do before I turn 26 list, or my rappers I'd like to face in a freestyle battle list) was to do an Ellis Island / Statue of Liberty trip which I finally got to do on this absolutely gorgeous Sunday! I know most people probably did this on school trips when they were in elementary school, but I grew up just two hours too far from the city for that. My sister tells me that I actually have been to Lady Lib but I just don't believe her as I have no recollection of this NYC trip. I really wanted to go to Ellis Island with family members so I ended up making the trip with my frousins (friends + cousins - don't worry about it, yes, again, we know how cool we are) and my frister (you can figure that one out). Katie, Emily, Mike and I met in Liberty State Park in Jersey City this morning, all miraculously within a few minutes of each other. We bought ferry tickets ($12 - two bucks more than our great-grandfather carried over from Ireland), went through airport-like security (no backpacks or large bags! ), and headed over to Ellis Island first. There are three levels to the Ellis Island memorial and lots of cool exhibits. In "The Peopling of America", there are displays about the history of immigration and statistics sliced any way you can imagine - immigrants by originating countries, gender, job held, favorite member of 'N Sync, etc. There is also an interesting piece with faces if you look at it one way and the American flag if you look at it the other way. HOW can I get my face on this flag?! "Peak Immigration Years" has photos, passports, propaganda to come to America, photos of the ships that came over, reasons why immigrants wanted to leave their homelands, and information about where they settled once they made it here. It also focuses on the impact that immigration has had on American culture. "Through America's Gate" shows what the immigrants had to go through during processing after landing on Ellis Island. In addition to the exhibits inside, there is, of course, a gift shop and cafeteria (I highly recommend the Jr Ranger Chicken Finger meal) and the "Wall of Honor" outside where donors pay to have their ancestors names inscribed. Luckily, someone else in the family had done this for our great-grandfather Philip so we got to check out his celebrity status fo' free. 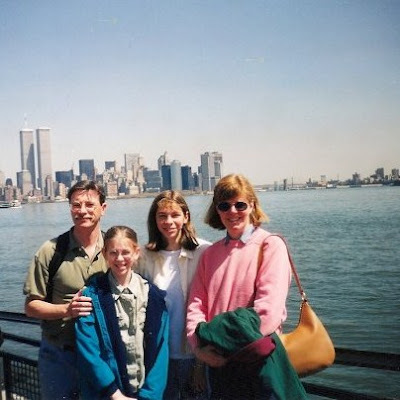 Once we finished everything on the island, we unsuccessfully tried to deter a seagull from eating a large piece of plastic, jumped in front of the memorial, and headed back on the ferry. We ventured over to the Statue of Liberty with the goal of climbing up, but they stop letting people up at 3:30, "no exceptions" even though some lady was furiously yelling at one of the park rangers, so we settled for some more "jumping in front of national monuments" instead and then took the ferry back while the sun was setting. I can't pick from these pictures which I like best so please enjoy the brief but beautiful montage. This trip was definitely one of my favorite tourist experiences in NYC so far because it was so meaningful, being at the place where my ancestors came in over 100 years ago. I'm pretty glad they came over so I could enjoy this fabulous city today. I'm sure this was their end goal. It's pretty obvious that one of the best things about living in NYC is that there is always something to do. It's not as obvious that one of these things to do would be to watch the International Quidditch World Cup. If you aren't familiar with Quidditch, we probably aren't very good friends. It is the game featured in Harry Potter, and while I don't have a Gryffindor scarf (Emily), I did spend a good amount of time at my cousin Claire's wedding right after the last book was released acting out spells with some of my other cousins. Yes, we are really cool and we are fully aware of this. I also have been frantically re-reading all seven books and re-watching all six movies in anticipation of HP and the Deathly Hallows (which Emily and I might go see after our Rockettes experience on Thursday). Emily, Mike, and Kara came in to the city to check this event out. Luckily it was only a few blocks from my apartment so I had no qualms about joining (although if this had been held in Brooklyn or Ohio, I might have gone anyway, because it was THAT cool.) Oh, and don't worry, there was a stand where you could get t-shirts, brochures, official rule books, and your own broomsticks and wands. It was pretty much the best possible way to spend a 60 degree Saturday in the city. And it's not every day that Quidditch is played in NYC, so if you can make it to De Witt Clinton Park (between 11th and 12th Avenues & 52nd and 54th Streets) tomorrow for the finals, you probably should. If for nothing else but to laugh. The commentators are *almost* as good as Lee Jordan. I suppose my obsession with food carts has been made public by this point. A particular food truck I follow on Twitter (@waffletruck aka Wafels & Dinges) has been tempting me for a few weeks now. So when my roomie texted me to tell me that there was a truck hanging out right near our apartment, I decided I would go today. But while checking out the website, I saw that it was only supposed to be there until 5, but that another truck would be on 6th and 21st until 10 pm. I took the E train up from work with my friend Jon and we both got a delightful little treat - even though the truck was parked at 7th and 21st instead. Check here for locations as it changes daily. Jon went classic and ordered a sweet liége wafel with dinges (toppings) of dulce de leche and walnuts. I decided to go a little obscure with my order "de bacon + syrup wafel" - advertised as "Scandalous and pretty much illegal in Belgium. Awesome in NYC" - with dinges of peanut butter, bananas, syrup, and whipped cream. Jon's wafel came out right away but we had to wait for mine to come out. And then "something went wrong" and mine had to be started all over. We ordered hot Belgian cocoa while we waited - which was amazing - and were rewarded for waiting with free Belgian cookies. My wafel finally was ready and was incredible. I didn't really know what the bacon would taste like with the sweetness, and didn't know if the peanut butter and banana would be overkill or not, but it was perfect! Katie - you would LOVE it and you should come get one with me the next time you are in NYC - in the meantime, now that I know what bacon + sugar tastes like, I am now willing to try your bacon brownies. My dinner (what? It had protein...) ended up being so filling that I walked the 2.1 miles home. And yes, I did google map it. The Christmas season seems to come earlier and earlier each year. My personal opinion is that the holiday season should start at the end of the Macy's Thanksgiving Day Parade when Santa comes out. But maybe, because there are so many wonderful things to do in New York City during the holidays, I can let it start a little earlier. And so I give you, my Holiday To-Do List in NYC for 2010. 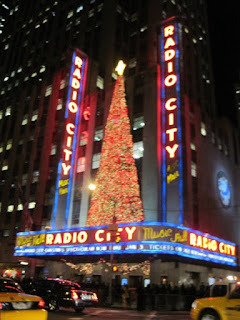 Radio City Christmas Spectacular - the dance show starring The Rockettes has been around for 75 years - I'm wondering if my mom-mom has ever seen it...she has lots of stories about her visits to NYC as a girl. Emily and I just bought tickets for next Thursday. I hadn't really paid much attention to it until last year at Christmas, Uncle Jeff and I watched a couple minutes of it and I decided I needed to go see it this year. Also, this woman on the subway today randomly decided to start talking to me about it. I'm taking that as a sign. Ice Skating - I've only been ice skating a few times and all I remember is falling a lot, but I'd like to attempt this again, now that I have learned a little bit of balance from having to ride the subway everyday. There are a bunch of options in the city, including The Ice Rink at Rockefeller Center, Central Park's Wollman Rink, and The Pond at Bryant Park. 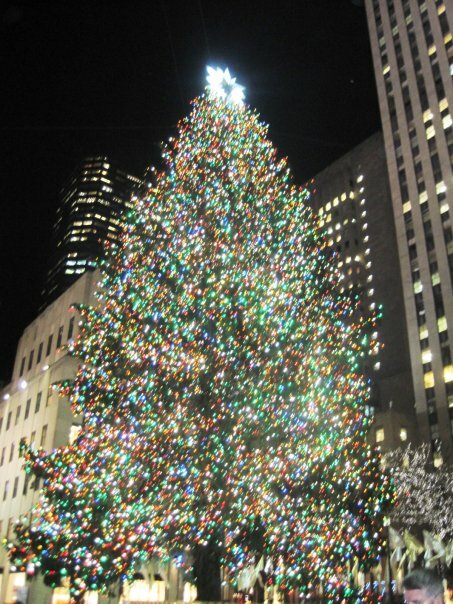 Rockefeller Center Christmas Tree Lighting Ceremony - Nicole and I are going to try to go this on Tuesday, November 30th. It's going to be really crowded, but maybe we will be able to watch it from one of our friend's offices...hint hint you know who you are. Study all the Holiday window displays on Fifth Avenue - suggested visits in "The Best Things to Do in New York" include Macy's "Miracle on 34th Street"-themed windows, Lord & Taylor (the first department store to have themed Christmas windows), Saks Fifth Avenue, Bergdorf Goodman, and Barney's (typically designed by Simon Doonan who I have seen on the streets in Soho multiple times). Make a snowman in Central Park - this will, unfortunately, be quite difficult because of my pure hatred for snow. But my guess is that Central Park will be so beautiful covered in white powder that I won't be able to complain. Alrightie, so who wants to join me? And do you have more suggestions? This morning, I found an article in the NY Times that made me decide to reminisce about my trip to Coney Island this past summer. "Coney Island Loses Longtime Boardwalk Vendors" discusses how nine businesses on the Coney Island boardwalk, some that could be considered staples, are being forced to shut down. On our trip, we had been to Beer Island, taken pictures of Paul's Daughter (in honor of our friend Paul), and made fun of Shoot the Freak (yes, this is actually a game on the boardwalk which involves a man running around a course with a shield and mask while children shoot paintballs at him...) As Paul sarcastically said when I told him the news, "Say it isn't so. Shocking that Shoot the Freak wasn't the biggest drawing card of Coney Island, you know, because it was so awesome and not weird at all." The Cyclone is one of the oldest wooden roller coasters still in operation and pretty much the scariest ride I've ever been on. Maybe it's me getting old, but I really felt in danger the entire time. From the moment it started until it stopped two minutes later, all I kept repeating was "Oh my God! I hate this! Why are we on this! Oh my God! I want it to stop!" with various curses scattered throughout. But people have been riding this roller coaster since 1927, so I guess, for some reason, this feeling that you are going to fall through the rickety wooden planks or keep going straight right off the tracks on these fast turns is desirable to some. Tonight I decided I needed to go to Madison Square Park (23rd and Madison). Normally, when I go to this cutesy wootsie park in Gramercy, it is so that I can stand in line for an hour and a half (because, as I mentioned Wednesday, New Yorkers LOVE to stand in line) and spend $20 at a hamburger stand. But, for the record, it is the best burger joint in the whole entire world and is totally worth it and I'm sure I'll dedicate an entry (or an entire website) to SHAKE SHACK soon. But tonight, since I love to pretend that I'm artsy - hence my pottery classes, this blog, the French beret I wore all through fourth grade, and the sketchbook I just bought - I went to the park to check out artist Jim Campbell's "Scattered Lights" - on display until February 28th. I realized, as I was sitting on the subway looking at my pictures and listening to The Lion King's "I Just Can't Wait to be King" on my iPod, that these need to be seen in person since my photos are sub-par, but alas, behold. The largest of the three installations, "Scattered Lights", is 2,000 light bulbs hanging over the Oval Lawn of the park. The lights turn on and off and look as if they are forming shadows of people walking by. Check out the video. The second piece, "Broken Window", shows blurred images of a street corner, of people walking by and cars passing. The third piece of work, "Voices in the Subway Station", has light squares planted in the ground which light up with the intent to show them "speaking to each other" in different pulses of light as if they are people's voices in the subway station. I know that sounds weird, but that's me pretending to be artsy trying to explain it. If I were wearing my French beret right now, you would totally get it. Check it for yo'selves and make sure to order a burger from the Shack while you're at it!